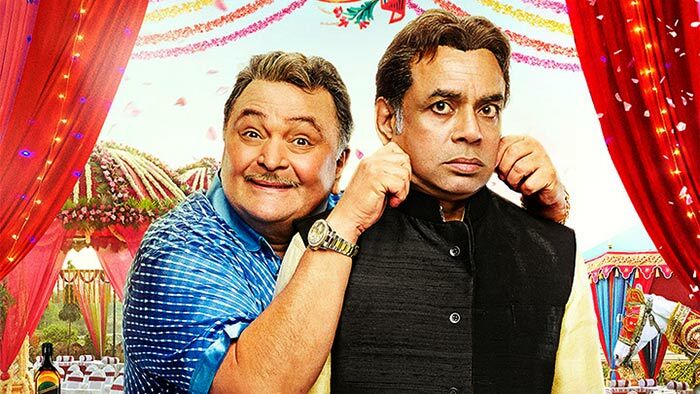 Paresh Rawal and Rishi Kapoor make Patel Ki Punjabi Shaadi a strictly one-time watch, says Prasanna D Zore. Formula films are easy to make. Hire two bankable actors -- usually, the hero and heroine pair up -- but in this case, it is Rishi Kapur and Paresh Rawal for Patel Ki Punjabi Shaadi and a known troupe around them -- Vir Das, Payal Ghosh, Prem Chopra and Divya Seth -- and get them to say peppy dialogues, involve a love angle and voila! a film is born. Formula remains king and the film-goer doesn't matter in Sanjay Chhel's PKPS. From Ek Duje Ke Liye to the more recent 2 States, films have dealt with inter-state marriages without lampooning the characters or stereotyping them. PKPS shows no such sensitivity towards its Gujarati and Punjabi characters. So, we have Hasmukh Patel (Rawal) and Guggi Tandon (Kapoor) at each other's throats -- the simple living, tradition-loving Patel crosses swords with the fun-loving, booze-swigging Tandon. When will we ever see a non-vegetarian Gujarati who doesn't wear khadi or a teetotaller Punjabi who doesn't do the bhangda at the drop of a hat? A foul-mouthed Punjabi, with a young son (Vir Das), moves into a Gujarati enclave and becomes Patel's neighbour. Sparks fly between Kapoor Jr and Patel's young daughter (Payal Ghosh). As you may have guessed, the Punjabi-hating father plays spoilsport. Chhel's cringe-worthy dialogues make matters worse. Sample this: Gujarati to Punjabi: If there were no Gujaratis in India, India's economy will collapse by 50 per cent. Punjabi to Gujarati: If there were no Punjabis in India, India's armed forces would reduce by 50 per cent. Sanjay Chhel, spare us such nonsense even if you have convinced Rawal and Kapoor to say these lines. Kapur and Rawal complement each other well and we would like to see them come together more often. They are the only reason to make PKPS a strictly one-time watch.